I have a feeling that this year is just going to fly by! In my quest to be more intentional with my time and be more prepared this year, I have created a simple monthly calendar with fun themes and simple activities and books as a companion to our Weekly Virtual Book Club for Kids. I find that we have a lot of time to create and explore some days, but since I'm not prepared or don't have the right materials out or available, we ended up doing the same few activities over and over again. Toddlers love repetition, so that works great, but sometimes it is fun to do something new and different! I also love exposing my kids to new children's book and helping them develop other skills. This year I will be sharing a free printable calendar each month in our Toddler Approved Newsletter. Our newsletter goes out weekly on Fridays (sometimes early morning Saturday on crazy weeks) and is filled with activities, book suggestions, and some simple parenting tips. 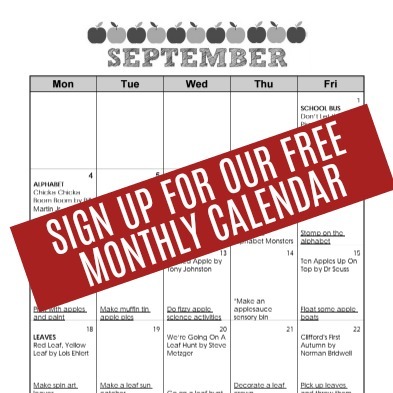 You can sign up for our newsletter and receive our free monthly calendar each month. You can either print it out or just use it on your phone/computer (the pdf links are clickable). You can do all of the activities in order the way that they are shared or pick and choose what works for you or that your child is interested in! Sometimes we'll do 2 activities one day and skip doing anything on a more busy day. The goal of our monthly calendar is to serve as a companion to our Weekly Virtual Book Club for Kids and get kids exploring, creating, and having fun with books. If you haven't joined our Weekly Virtual Book Club for Kids yet, go here to sign up. It is FREE! There will be additional themed ideas shared in our Facebook group each week. You can find more details about our Weekly Virtual Book Club for Kids here. 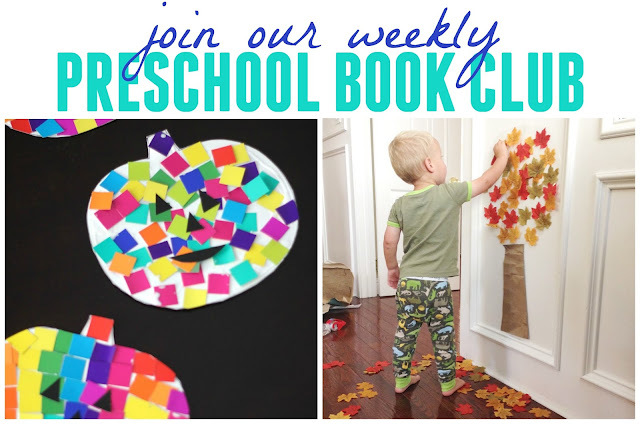 When you sign up for our Toddler Approved Newsletter you'll also receive our free printable Virtual Book Club book/theme list for September-October. We are kicking off our 2017-2018 Virtual Book Club for Kids on Monday, so we hope you'll join us!